The technique employed in creating yachimun (pottery in the Okinawan dialect) in the Ryukyus was imported from China around the middle of the 14th century and was later influenced by Japanese and Korean ceramics. Sturdy construction and distinctive hand-created designs are the unique characteristics of Okinawan pottery. 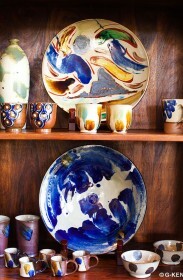 Including plates, sake bottles, vases, flowerpots, incense burners, light shades and coffee cups, potters produce quality pieces by employing traditional methods and at the same time promote the development of new techniques. A number of young and innovative potters are actively participating in the art. 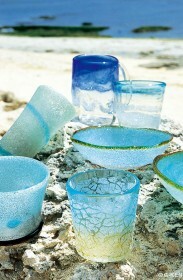 Reflecting Okinawa’s cultural landscape, Ryukyu glassware boasts extremely unique designs and vivid colors that remind one of the island's natural beauties. Including tableware for everyday use and smaller items ideal for souvenirs, various kinds of Ryukyu glass products are available. Their formal tableware is perfect for special occasions. Okinawan textiles developed under the influence of fabrics from Southeast Asia, China and mainland Japan. 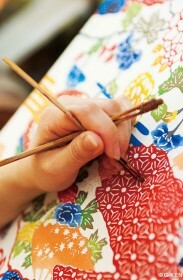 The rich variety and technique of Okinawan textiles are beyond compare, even surpassing those of mainland Japan. Okinawa is blessed with a variety of subtropical plants that can be used to dye textiles. Turmeric produces yellow pigment, and Japanese bayberry results in brown. And several different kinds of plant pigments are mixed to achieve a wide color range. In the days of the Ryukyu Kingdom Okinawan women used to do their hair up with jiifaa, or traditional silver hairpins. 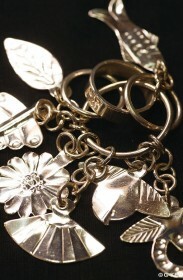 Kenji Matayoshi, a descendant of a family that worked silver for royalty, is an artisan called a kugani-jeeku, one who makes jiifaa of the old days. Kugani-jeeku in the Rykyuan language is transcribed as “goldsmith” in kanji, but kugani (gold) is also a general term for metals, and Matayoshi specializes in silverwork in particular. 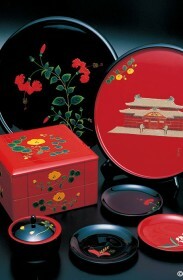 Produced in Okinawa’s unique subtropical environment, Ryukyu lacquerware is characterized by the vividness of its contrasting blacks and reds. Okinawa fortunately possesses the fine native woods ideal for lacquerware including deigo, suitable for serving trays and bowls because it rarely becomes deformed or cracked; sendan (chinaberry tree) with a beautiful grain; and banyan trees.